What is a bongo net and why do we use it? 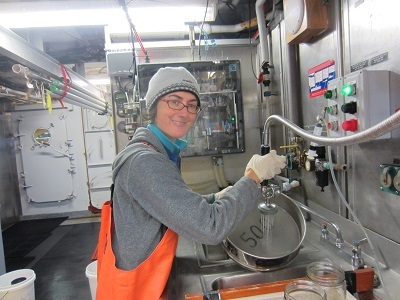 As I mentioned in a previous entry, one of the aspects of this cruise is a zooplankton survey, which happens at the same stations where we trawl for juvenile pollock. The zooplankton are prey for the juvenile pollock. 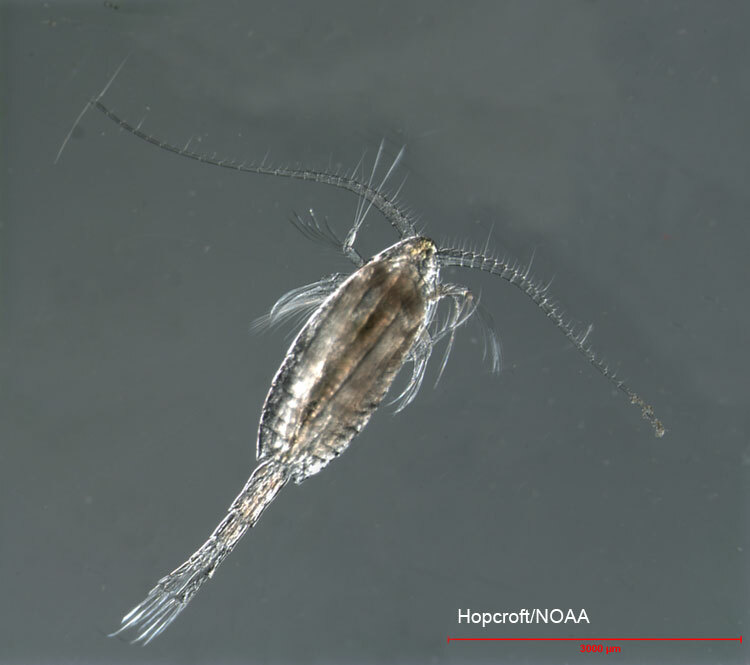 There are many types of zooplankton including those that just float in the water, those that can swim a little bit on their own, and those that are actually the larval or young stage of much larger organisms like crab and shrimp. We are interested in collecting the zooplankton at each station because because we are interested in several aspects of juvenile pollock ecology, including feeding ecology. In order to catch zooplankton, we use a device called a bongo net. The net gets its name because the frame resembles bongo drums. The bongo net design we are using includes 2 small nets on a 20 cm frames with 153 micrometer nets attached to them and 2 large nets on 60 cm frames with 500 micrometer nets. The 500 micrometer nets catch larger zooplankton and the 153 micrometer nets catch smaller zooplankton. In the picture above, there are just two nets, but our device has 4 total nets. At the top of the bongo net setup is a device called the Fastcat, which records information from the tow including the depth that bongo reaches and the salinity, conductivity, and temperature of the water. What happens during a bongo net tow? The process of collecting zooplankton involves many people with a variety of roles. It usually takes three scientists, one survey tech, and a winch operator who will lower the bongo net into the water. In addition, the officers on the bridge need to control the speed and direction of the boat. All crew members are in radio contact with each other to assure that the operation runs smoothly. Two scientists and a survey tech stand on the “hero deck” and work on getting the nets overboard safely. Another scientist works in a data room at a computer which monitors the depth and angle of the bongo as it is lowered into the water. It is important to maintain a 45 degree angle on the wire that tows the bongo to make sure that water is flowing directly into the mouth opening of the net. One of the scientists on the hero deck will use a device that we lovingly call the “frying pan,” but more accurately it is called a clinometer or inclinometer. The flat side of the device gets lined up with the wire and an arrow dangles down on the plate and marks the angle. The scientist calls out the angle every few seconds so that the bridge knows whether or not to increase or decrease the speed of the ship in order to maintain the 45 degree angle necessary. Scientist Peter Proctor holds up the “frying pan” also known as a clinometer or inclinometer, which is used to measure the wire angle of the bongo when it’s in the water. Meanwhile, back at the computer, we monitor how close the bongo gets to the bottom of the ocean. We already know how deep the ocean is at our location because of the ship’s sonar. The bongo operation involves a bit of simple triangle geometry. We know the depth and we know the angles, so we just have to calculate the hypotenuse of the triangle that will be created when the bongo is pulled through the water to figure out how much wire to let out. The survey tech uses a chart that helps him determine this quickly so he knows what to tell the winch operator in terms of wire to let out. In the images below, you can see what we are watching as the bongo completes its tow. 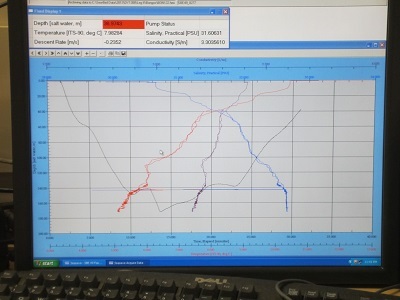 The black line indicates the depth of the bongo, and the red, purple, and blue lines indicate temperature, conductivity, and salinity. This is an example of a good bongo tow. The black line on the left of the graph shows a consistent tow angle both up and down. The key is that the black line should have a “v” shape on the graph if the tow is good. This graph shows what happens when a bongo gets caught in the current and stays at the same depth for a while. Look at how the black line isn’t smooth, but levels off for a bit. This happened with the bongo both when it was going down and coming back up to the surface. When the bongo is within in 10 meters of the bottom, the survey tech radios the winch operator to start bringing the bongo back up. It usually takes longer for it to come up as it does for it to go out, nevertheless, the 45 degree wire angle needs to be maintained. When the survey tech sees the bongo at the surface of the water, the two scientists on the hero deck get ready to grab it. This operation can be quite difficult when it’s windy and the seas are rough. If you look at the sequence of the photos below, pay attention to the horizon line where the water meets the sky and you can get a sense of the size of the swells that day. Bongo nearly over the railing of the hero deck. Pulling the nets over the railing. Finally pulling up the codends of the bongo net. Note the change in the horizon line on all 4 pictures. There were pretty big swells this day. 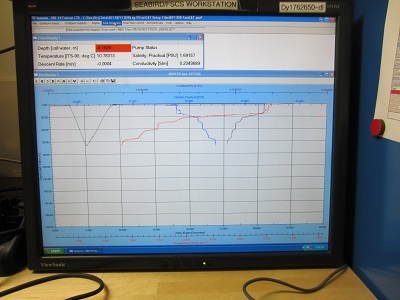 When the bongo is safely back on deck, the person in the data room records the time of the net deployment, how long it takes to go down and up, how much wire gets let out, and the total depth at the station. If anything goes wrong, this is also noted in the data sheet. As the bongo reaches the surface, the scientists grab the net keep it from banging into the side of the ship. When the net is on board, the next step is to read the flowmeters on the nets that indicate how much water has flowed through them. Then we rinse the nets and wash all of the material down the nets and into the “codends” at the very end of the net. These are little containers that can be detached and emptied to collect the samples. Vince, the survey tech, and Peter the scientist prepare to read the flowmeters on the bongo. Once the codends are detached, they are taken to the wet lab and rinsed. Each of the four parts of the net has a codend where the zooplankton are caught. The zooplankton are rinsed out of the codends into a sieve and then collected in a jar and preserved with formalin. The purpose of having two of each of the 20 cm and 60 cm bongo nets is to ensure that if one sample is bad or accidentally dumped, there is always a backup. 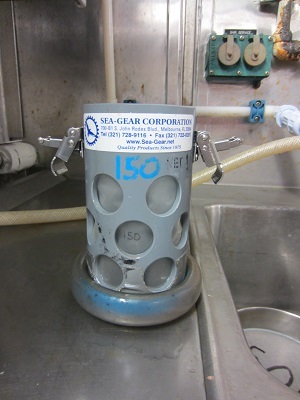 I have had to use the backup once or twice when there was a big jellyfish in the codend that kept me from getting all of the zooplankton out of the sample. The codend from the 150 micrometer bongo net. Britta rinsing the 500 micrometer sieve. After we collect the zooplankton the samples are shipped to Seattle when we return to port. Back in the labs, the samples are sorted, the zooplankton are identified to species, and the catch is expressed at number per unit area. This gives a quantitative estimate of the density of plankton in the water. A high density of the right types of food means a good feeding spot for the juvenile walleye pollock! This sorting process can take approximately one year. I think it’s pretty amazing how much work goes into collecting the small samples we get at each station. Just to think of all of the person hours and ship hours involved makes me realize how costly it is to study the ocean. 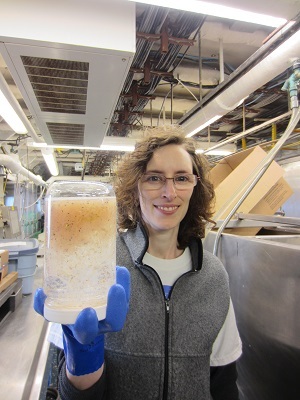 Scientist Colleen Harpold holding up one of the preserved jars of zooplankton. 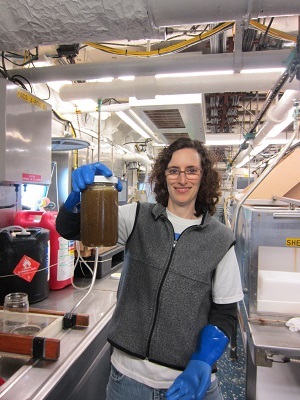 Scientist Colleen Harpold holding up one of the preserved jars of zooplankton that has A LOT of algae in it too! It is hard to believe that I’ve been on the ship a week now. It feels strange that just 7 days ago I had never heard of a bongo net or an anchovy net. Now I see them every day and I know how to identify several types of fish, jellyfish, and zooplankton. I love working with the scientists and learning about the surveys we are doing. Nearly every trawl reveals a special, new organism, like the Spiny Lumpsucker – go look that one up, I dare you! We don’t have much down time and I’m trying to blog in between stations, but sometimes the time between stations after we finish our work can be 45 minutes and sometimes just 15 minutes. So we are pretty much on the go for the whole 12-hour shift. That’s where the fortitude part of Teacher at Sea comes in. You definitely need to have fortitude to endure the long hours, occasional seasickness (I like to think of it as “sea discomfort”), and periodic bad weather. By now though, it all seems routine and I’d like to think I’ve gotten used to being thrown around in my sleep a little now and again when we hit some rough seas. This experience has been so worthwhile and even though I look forward to the comforts of home, I don’t really want it to end. When I graduated from college, I worked with a herpetologist studying lizards in the desert south of Carlsbad, New Mexico. I have fond memories of living in a tent for four months and collecting lizards all day to bring back to camp to measure and check for parasites. I often miss doing scientific work, so Teacher at Sea has given me the opportunity to be a scientist again and to learn about a whole new world in the ocean. What a treat! One of the reasons I chose to be a teacher was to be able to share my excitement about science with students and I feel so lucky that I get to share this experience too. There are two species of Metridia, a type of copepod (zooplankton), that are found in the Gulf of Alaska/Bering Sea. One of them is called Metridia lucens and the other one is Metridia oketensis. 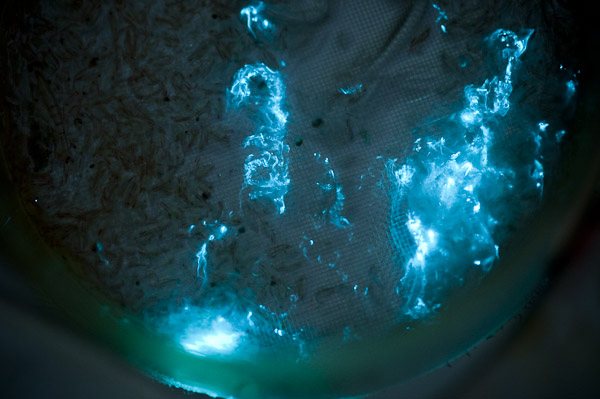 These copepods are bioluminescent, which means that they glow when they are disturbed. They sometimes glow when they are in the wake of the ship or on the crest of a wave. Tonight when I was draining a codend into a sieve, my sieve looked like it had blue sparkles in it, but just for a second! I asked our resident zooplankton expert, Colleen Harpold what they might be and she thought that my blue sparkles likely belonged to the genus Metridia. If you are interested in reading a little more about Metridia, check out this blog from Scientific American on copepods in the Bering Sea! Thanks for reading! Please leave me some comments or ask questions about any of the blog posts and feel free to ask other questions about the work we are doing or what it’s like at sea! I would love to be able to answer real-time while I am at sea. 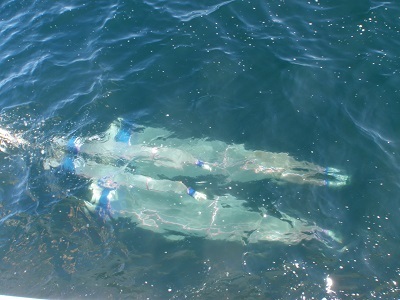 This entry was posted in 2013, Britta Culbertson, NOAA Fisheries Service, NOAA Teacher at Sea and tagged BONGO, metridia, Oscar Dyson, zooplankton. Bookmark the permalink. Hey Britta, so do the bioluminescent fish get that way from eating bioluminescent zooplankton? I know that some anglerfish that bioluminesce do so as a result of a symbiotic relationship with bacteria. However, with the lantern fish there are photophores on the side of the fish, which are tiny organs that produce the light because of a chemical reaction. The name of the pigment that undergoes the chemical reaction is called luciferin. Why are the zooplankton receptacles so small? 150 micrometers doesn’t seem very big. 🙂 And assuming they’re very small, how many zooplankton do you hope to catch at a time? Is there a threshold number under which you’ll throw it back and try again? The diameter of the “mouth” of one net is 60 cm and the mesh on that net is 500 micrometers. The smaller net’s mouth is 20 cm in diameter and the mesh on that is 150 micrometers. I might not have explained that set-up well enough. The mesh is that fine to be sure we catch the smallest zooplankton. The next blog I’m working on has photos of some of the species to give you an idea. There isn’t a threshold amount we are trying to catch, we are just trying to get a sample of what types of zooplankton are at a location on our grid that we are traveling. Later on the samples will be identified and quantified (species per unit area). We only do a collection over again if there’s some kind of failure. 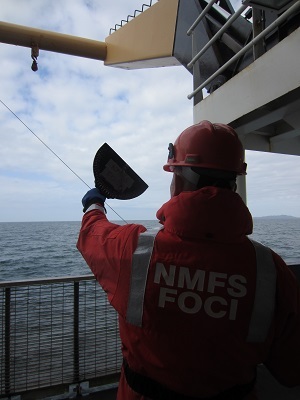 For instance, on our last trawl (for catching fish, not zooplankton) the net ripped, so we went back to the same location and did it over with a new net. The reason why we are catching zooplankton and fish at the same location is to see what kind of fish are at the location and what kinds of prey items (zooplankton) are there too. Interestingly, I always think we will have a lot of zooplankton when we see whales around, but that hasn’t been the case. Thanks for the great question! Duh. Of course that tube you took a picture of isn’t 150 micrometers across. Thanks for the clearing up though! Looking forward to seeing pics of the little guys! No problem! Next post is awaiting clearance, so hopefully it should be up soon. Thanks for the comments! Britta – we used 2 types of Bongos – the ones like you are using but also a mini-bongo that was put on top of the other. The mini was to sample for icthyoplankton for one of the scientists that joined us 1/2 way through my TAS experience. Our samples were sent to Poland to be counted! Pretty crazy! Anyway, my students have been learning a lot about plankton and are actually designing there own – I will make sure they read your post! Great blog! Britta, what kind of weights do you actually get of the zooplankton when it’s out? Just curious. Interesting! We don’t weigh the zooplankton samples, they just go straight to a jar. Sometimes we do have euphausiids (krill) in the trawl net though and I can try to note how much we get. One night we had so many, their must have been at least 0.5-1 kg. Stay tuned for the next blog, which shows the types of zooplankton we are collecting. I just weighed the krill (euphausiids) we got in the last trawl (not the bongo net, but the anchovy net, which I have yet to write about). In any case, there were 1.2 kilograms of krill from that trawl. It’s a 5 mm net we are using for that trawl. Pics and blog to come soon. I am a student of Sue Cullumber’s, and I was wondering why bioluminescent fish and zooplankton are important to the ecosystem. I also am curious as to how bioluminescent fish survive and thrive. It’s probably easier for me to explain the role of zooplankton, so let me start there. Zooplankton are food for larval (baby) fish and other organisms like salmon and even whales. So you might say that after phytoplankton (producers like plants), zooplankton are a the bottom of the food chain. So all of the organisms in trophic levels above zooplankton would be affected if zooplankton were to disappear. In other words, if whales eat zooplankton and zooplankton were to disappear, what would happen to the whales that eat them? Most bioluminescent fish live deep in the ocean, so the glow helps them to communicate in the deep dark waters. I learned of your blog just today, and have linked to it on the NOAA/PMEL EcoFOCI website http://www.ecofoci.noaa.gov/ (“New”). Thanks for posting, and I hope your cruise has been great! Thanks for sharing my blog! I learned so much on the cruise, so it was great to be able to share it with readers. It’s awesome that the blog has found a home on the EcoFOCI website. What an honor!